U.S. campuses have been hotbeds of political and social debate since the colonial era. By the 1960s, rising civil unrest bouyed the Free Speech Movement at the University of California, Berkeley. As protests spread, universities and law enforcement cracked down leading to fatalities in separate incidents at Kent State University and Jackson State University. Today campus protests are once again eliciting an escalated police presence. Both public and private universities are struggling how to balance the free exchange of ideas, but public universities have a legal obligation to protect campus freedom of expression. What does this mean for students, campus free speech and speaker’s right to free speech when it is suppressed by the fear of disruption? For news, analysis, history and legal background read on. Data analysis from Georgetown’s Free Speech Project suggests that a free speech crisis on college campuses is not as dire as many claim. The project found roughly 90 incidents since 2016 in which a person’s free speech rights were threatened according to their criteria, of which two-thirds of the cases took place on college campuses. They also found that most of the incidents involving speakers on campus involved a handful of the same individuals, and found instances in which left-wing speech was shut down as well. Sanford Unger directs the Knight Foundation-funded Free Speech Project at Georgetown and writes on findings of the recently released report on the state of free speech on college campuses. The University of West Florida has eliminated its “free speech zones,” which were specific areas on campus where free speech was confined to. Students at the public university will now be able to exercise their right to free speech throughout campus with some time, place, and manner restrictions. A new law aimed at protecting controversial speakers visiting Louisiana colleges was signed by Governor John Bel Edwards and has taken immediate effect. Under Senate Bill 364, now Act 666, colleges and universities will be required to spell out speech policies and advertise them in student handbooks and on websites. In conjunction with the Board of Regents, schools must develop policies that say that students and faculty may discuss any topic and assemble as long as it is legal and non-disruptive of school functions. Additionally, schools must indicate that they will strive to ensure the fullest degree of intellectual freedom and free expression and that it is not the role of the institution to shield individuals form protected speech under the First Amendment. The Department of Justice filed a “Statement of Interest” in a case between D.C.-based civil rights liberties group Speech First and University of Michigan’s President Mark Schlissel over the school’s speech code and anti-bullying policy. On the same day, UM announced that it revised its policy. Speech First alleges that the university’s policy is too broad and violates the First Amendment because it may cause students to censor their speech. The DOJ’s Statement of Interest argues that UM’s code of conduct is unconstitutional and “chills” protected speech. A university spokesperson says that the lawsuit paints a “false portrait of speech” on campus by misstating UM’s policy. The spokesperson said that the Bias Response Team, which the DOJ claimed were bestowed with disciplinary power, do not in fact have that authority. Rather, the team supports students on a voluntary basis. The DOJ notes that this case is the fourth Statement of Interest filed in a First Amendment case under Attorney General Jeff Sessions. This isn’t the first time University of Michigan has been challenged over their speech code. A court ruled against UM in 1989 over the adoption of a speech code. A student filed a suit against the university because he alleged that the speech code, amended to the school’s policy as a response to hate speech, prevented him from having conversations about race and gender. The district court ruled in favor of the student and against UM on the grounds that the policy was vague and too broad. March 12, 2018: Can a New Generation Redefine the Meaning of the First Amendment? Gallup, the Knight Foundation, the American Council on Education, Charles Koch Institute and the Stanton Foundation worked together to update a 2016 landmark survey of college students and their thoughts on their First Amendment freedoms. Topics included: “whether college students ever consider violence or shouting down speakers acceptable, whether they believe certain groups of students can freely express their views on campus and whether social media has displaced public areas of campus as the venue for discussing political and social issues.” The results show shifting attitudes to freedoms protected by the First Amendment. Ballard Spahr outlines what it sees as the critical issues in campus speech today. CBS News documents the current state of campus protests. Graduate student Mark Daniel Neuhoff posted alleged racist comments on what he thought was a private forum. An undergraduate, Tori Coan, got wind of his statements and led a petition to fire him from his teaching assistant position. Coan and other student protesters even disrupted the “State of the University” speech delivered by Virginia Tech’s president. Now the campus is divided over whose free speech and privacy was violated. Taking a cue from clashes at other college campuses, including Berkeley, over controversial speakers, the Governor of Florida declared a state of emergency ahead of white nationalist Richard Spencer’s speech at Gainesville. The Miami Herald gives a play by play of the day. The New York Times excerpts students comments on free speech. Last spring, Ann Coulter’s speech at Berkeley was cancelled after concerns that protests would erupt into violence. She plans her return at Berkeley’s “Free Speech” week along with Brietbart editor Steve Bannon and conservative provocateur Milo Yiannopoulos. The Wisconsin State Assembly sent to the State Senate last week the Campus Free Speech Act, legislation which would institute severe penalties — including suspension or explosion — for University of Wisconsin students who engage in “violent, abusive, indecent, profane, boisterous, obscene, unreasonably loud or other disorderly conduct that interferes with the free speech of others.” In an interview on NPR’s “All Things Considered,” the bill’s Republican sponsor said that his legislation was intended to provide “a basic framework that protects the constitutional rights of everyone on the campus.” Governor Scott Walker is expected to sign the legislation once it is passed by the State Senate. In April, the North Carolina House of Representatives passed H.B. 527, legislation which would mandate that public universities take disciplinary action against students “who disrupt events or interfere with others’ free speech rights.” The bill would also obligate the UNC Board of Governors to form a Committee on Free Expression, which would make recommendations on how state schools could remove barriers to free speech on their campuses. The University of California at Berkeley offered alternative dates for an event featuring Ann Coulter, after canceling the initial event due to concerns about safety. Coulter rejected the alternative dates, after the conservative groups sponsoring the event pulled out. They blamed Berkeley for failing to provide adequate security. After canceling a speech scheduled to be delivered by Ann Coulter, the University of California at Berkeley was sued by Berkeley College Republicans and Young America’s Foundation. The plaintiffs accuse the University of violating the First Amendment rights of its conservative students, a minority group on campus, by discriminating against speakers with a conservative viewpoint. The University refuted the accusations made in the lawsuit, saying that they respected the right of people of differing viewpoints to speak on their campus. Berkeley College Republicans cancelled a planned speech by David Horowitz, a conservative writer, and blamed the University’s administration. While public schools are not allowed to discriminate against potential campus speakers on the basis of viewpoint or ideology, they are able to impose uniform and reasonable time, place and manner restrictions. Prohibiting individuals from speaking because of their ideology, unless they are advocating immediate violence, is generally considered unconstitutional. July 2, 2018: How To Interpret The First Amendment In The Age Of Social Media Trolls? The New Yorker reports on the re-examination of free speech on campus in an age of provocative social media personalities like Milo Yiannopoulos. June 14, 2018: Are Campus Free Speech Guidelines #Trending? The New York Times highlights a trend among some Republic-led state legislatures to impose policies and bills to establish campus free speech guidelines at public colleges and universities, as an anecdote to combat campus protests. Although public universities are considered public forums, universities do retain the ability to restrict when and where public speakers are able to speak — although these restrictions cannot be based on the content of their speech. Public universities do have “some latitude” to restrict speakers, but those restrictions must be reasonable and applied fairly. In 1964, student activists at Berkeley launched a free speech movement that would spread nationwide by insisting that the University administration remove restrictions on campus expression. A half century later, the cancellation of an event featuring Milo Yiannopoulos has sparked a “battle” over free speech at the California college. As campus protests make news, FIRE’s mission to promote academic freedom and freedom of expression on campus grows. 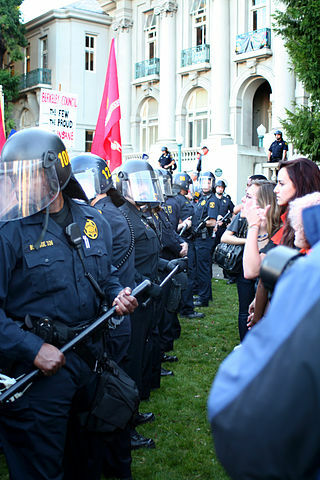 October 25, 2012: Is Campus Free Speech a Sham? In an opinion piece in The New York Times, President of the Foundation for Individual Rights in Education (FIRE), Greg Lukianoff, says that campus free speech does not exist and cites examples of where students’ voices have been consistently suppressed. “Colleges have promulgated speech codes that are not only absurd in their results but also detrimental to the ideals of free inquiry. Students can’t learn how to navigate democracy and engage with their fellow citizens if they are forced to think twice before they speak their mind,” he writes.